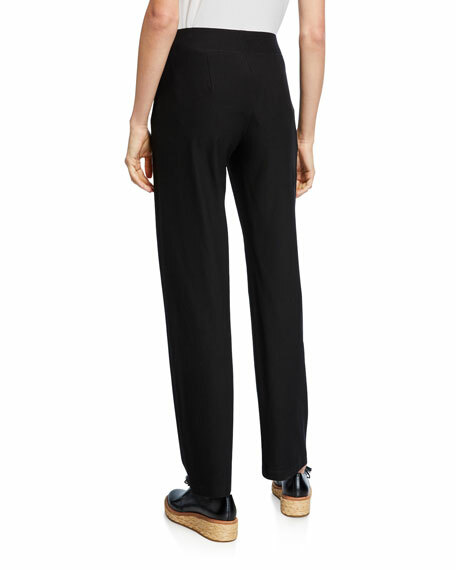 An Eileen Fisher favorite for their versatility and fit, these pants maintain their shape. Straight style skims from hip to hem. Akris punto "Francoise" pants in metallic houndstooth. High-rise; flat front. Front square pockets. Hidden side zip. Tailored fit. Straight legs. Akris punto "Francoise" pants in metallic houndstooth. High-rise; flat front. Front square pockets. Hidden side zip. Tailored fit. Straight legs. Cotton/polyester/nylon/spandex. Imported of Italian materials. Eileen Fisher pants in stretch crepe. Wide banded waist with hidden pocket. Fitted through hips. Slightly flared from knee. Pull-on style. Viscose/nylon/spandex. Machine wash or dry clean. Made in USA. Model's measurements: Height 5'10"/177cm, bust 33"/84cm, waist 25.6"/65.2cm, hips 35.8"/91cm, dress size US 2-4/FR 34-36. 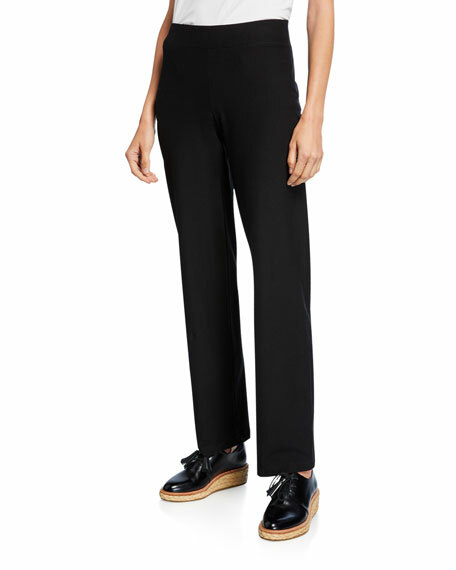 EXCLUSIVELY AT NEIMAN MARCUS Eileen Fisher stretch crepe pants. Approx. 29" inseam. Mid-rise banded waist. Modern straight leg. Hem hits ankle. Viscose/nylon/spandex. Made in USA of imported material. Model's measurements: Height 5'10"/177cm, bust 33"/84cm, waist 25.6"/65.2cm, hips 35.8"/91cm, dress size US 2-4/FR 34-36. Eileen Fisher slouchy pants in yarn-dyed handkerchief linen. Approx. measurements: 10.2" rise; 29" inseam. Side slash pockets. Mid-rise elasticized waist. Eileen Fisher slouchy pants in yarn-dyed handkerchief linen. Approx. measurements: 10.2" rise; 29" inseam. Side slash pockets. Mid-rise elasticized waist. Straight, relaxed legs. Cropped at the ankle. Pull-on style. Organic linen. Lining, cotton. Machine wash. Imported.